Please click HERE for this week’s message from Ms. Gronau. Click HERE for a photo from the Day of Silence. TEACHER APPRECIATION WEEK: May 1-5 is Teacher Appreciation Week, which is shorthand really for everyone who works at MMS and helps make it such a special place for our middle schoolers. Teachers, secretaries, administrators, guidance counselors, custodians, school nurse, social workers, etc. -- we’re so grateful for all of the hard work that each and every one of them puts in each day. To help show some love your HSA has planned a really fun week for everyone. Check out all the great stuff HERE. 8th GRADE END OF YEAR ACTIVITIES: Lots of really fun things happening for our graduating 8th grade students in the coming weeks. Please click HERE for the letter from 8th grade team leaders regarding participation in 8th grade activities and HERE for the Frog Bridge permission slip, due with payment by Wednesday, May 17th. A MESSAGE FROM NURSE PORTER: Our very own fabulous Nurse Porter has a message for all of us and our well-being: "As we welcome spring, many of us also have to deal with the discomfort of seasonal allergies. Understanding allergic reactions, minimizing pollen exposure, and considering allergy medication may help reduce symptoms of seasonal allergies. Please read the message HERE for tips for pollen survival." 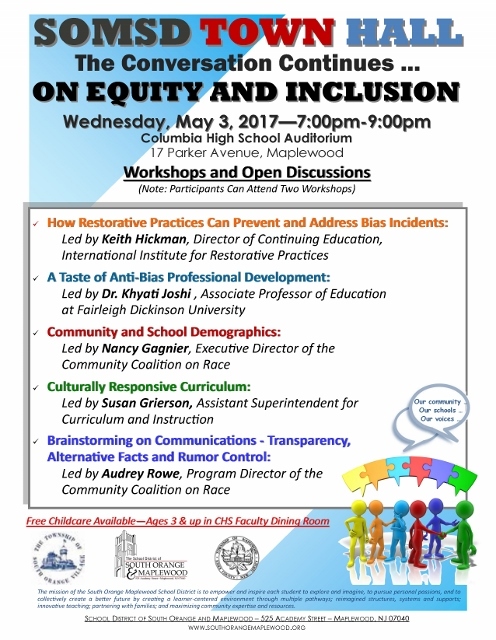 SOMSD TOWN HALL ON EQUITY AND INCLUSION: Don’t miss this important District-wide meeting on Wednesday, May 3rd from 7pm-9pm in the CHS auditorium. All info on the workshops and discussion leaders and the event can be found HERE. 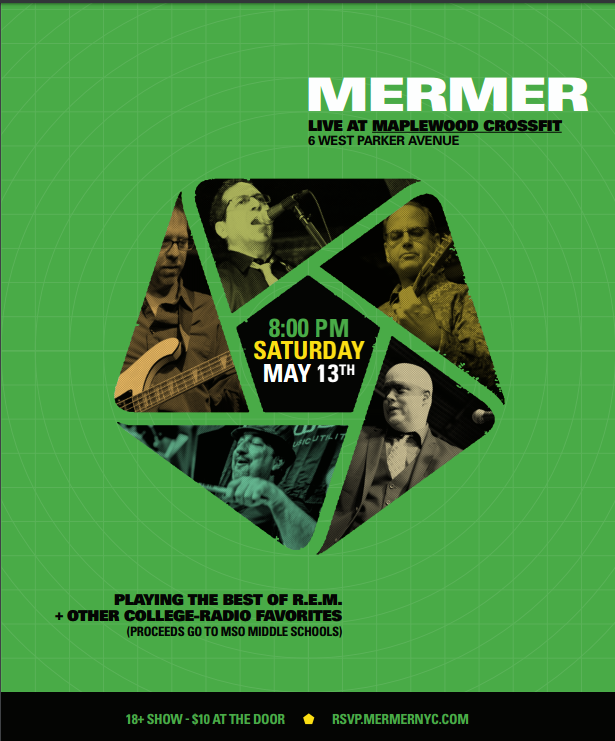 MERMER CONCERT TO BENEFIT MIDDLE SCHOOLS: Save the date -- Mermer will be holding a concert to benefit MMS & SOMS on Saturday, May 13th at 8pm at Maplewood Crossfit (6 West Parker Avenue). Kegs and light snacks and music from college, all to benefit our kids -- sounds pretty great! Click HERE for the flyer. 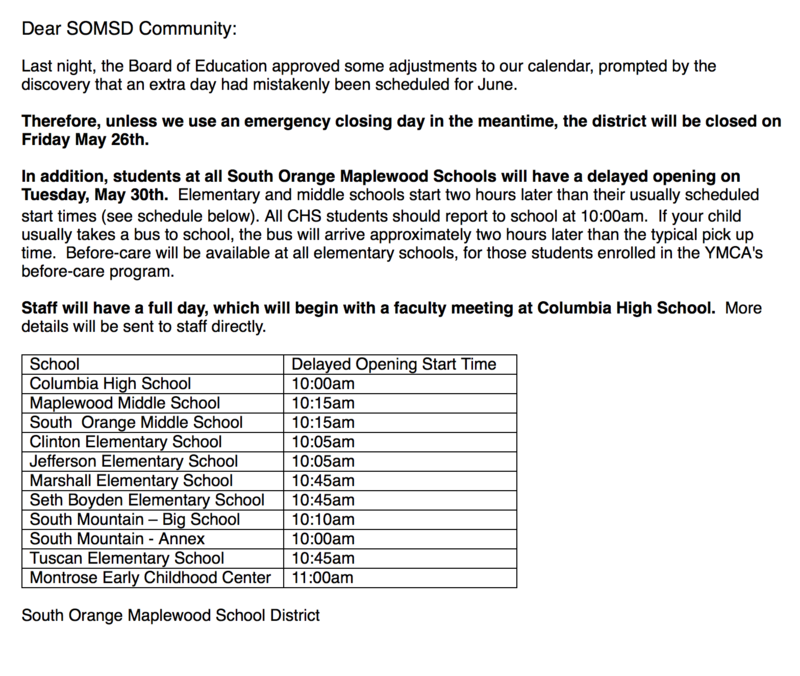 SOMSD DISTRICT CLOSINGS/DELAYED OPENINGS: Did you get the email from the School District this week? Apparently they counted wrong and scheduled one too many days of school! Which means a 4-day weekend for Memorial Day topped off with a delayed opening Tuesday, May 30th (10:15am start time at MMS). Check out the email HERE. And now for your regularly scheduled eblast ….. 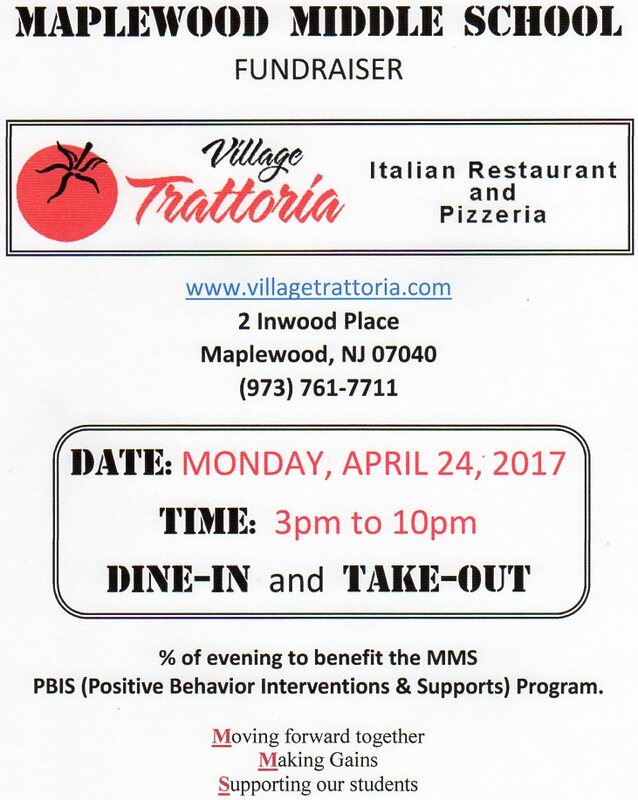 VILLAGE TRATTORIA FUNDRAISER: Dine-in or take-out from the Trat tomorrow Monday, April 24th anytime from 3pm-10pm and a percentage of your bill goes to MMS. Win win! More info is HERE. BOARD OF ED MEETING: The next BOE meeting is Monday, April 24th at 7:30pm in the CHS library. OUT OF DISTRICT PLACEMENTS: There’s a Special Ed PTO meeting focused on Out of District Placements on Tuesday, April 25th at 525 Academy Street at 7:30pm. More info can be found HERE. 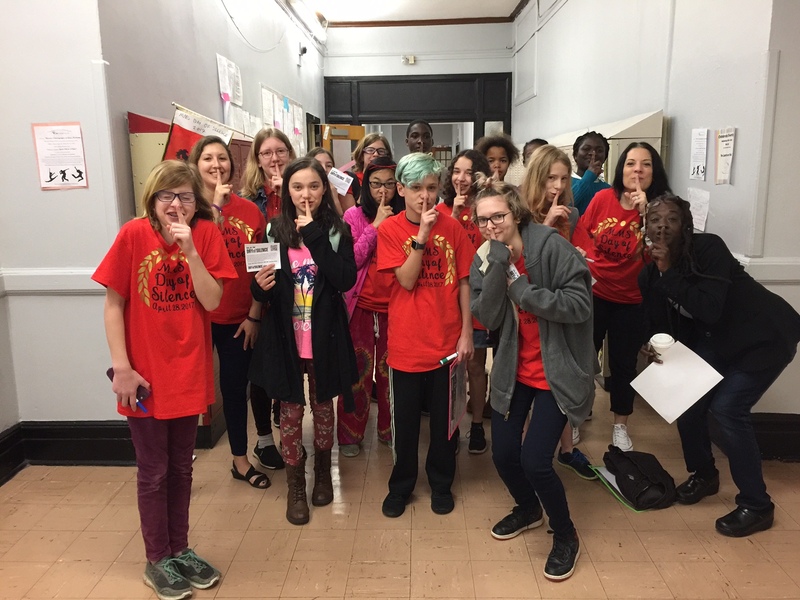 SPECTRUM CLUB DAY OF SILENCE: The MMS Spectrum Club is sponsoring a Day of Silence in school on Friday, April 28th. The purpose of this silent protest is to have a day of action in which students across the country vow to take a form of silence to call attention to the silencing effect of anti-LGBT bullying and harassment in schools. More info on the MMS protest can be found HERE. MAKER MADNESS: The Achieve Foundation is sponsoring Maker Madness this Saturday, April 29th from 10am-4pm at CHS. Check out the flyer HERE. Ok! That’s everything for now. PARCC TESTING: PARCC testing continues this week for the 7th graders. Monday thru Thursday, no testing Friday. YOUTH IN ACTION NIGHT: Mrs. Felder’s Students for Social Change club has been working all year on their research project to showcase at Rutgers in May. Please come out to see of all of their hard work on social justice issues on Wednesday, April 5th from 4pm-6pm in the SOMS auditorium. All info can be found in the flyer HERE. CHS SCHOOL IN ACTION NIGHT: CHS is holding its School in Action Night on Wednesday, April 5th from 6:30-9pm. Check out the Village Green article HERE for all the info. 7th GRADE SOCIAL: 7th graders get to have some fun Friday afternoon! The last two periods of their day will be HSA sponsored pizza, games, and community building exercises. Thanks so much to team leaders Mrs. Felder & Mr. O’Dell for coming up with the terrific idea! Want to help out? Please reach out to HSA rep Janine Marks at jcmarksnyc@yahoo.com. CITY CHALLENGE OBSTACLE RACE: Join Mr. Mantes’s MMS Fitness Club in this fun City Challenge Obstacle Race on Saturday, April 22nd. The team will be in the 11am wave and they would love a huge group of parents and students to join them! Check out the website HERE and contact Mr. Mantes at rmantes@somsd.k12.nj.us with any questions. MAKER MADNESS: The Achieve Foundation is once again sponsoring Maker Madness. Save the date! Saturday, April 29th from 10am-4pm at CHS. Check out the flyer HERE.